Before we will examine Scripture on this topic, we will have to discuss the philosophical presuppositions of the views through which people interpret the Bible. Although God’s Word is our primary axiom of authoritative teaching, our primary axiom of identifying errors in interpretation is our God-given mental capacity to reason, i.e. to scrutinize. If there is a flaw in our reasoning, we can’t fully understand the authoritative teaching of the Bible. We argue from Scripture, yet in so doing, we have to use Reason accurately. Two key important notions in this debate are predestination and free will. In philosophy these are known as Divine Determinism and Libertarianism. The traditional Reformed view of God’s providence includes the first and precludes the latter. I will make an attempt to put these two views in perspective just briefly. Divine Determinism is the view that God, before the creation of the world, has predetermined exactly whatever comes to pass. Whether directly or through specific secondary conditions, God is causally involved in every event. From the smallest movement of atoms to the formation of entire galaxies, all must come to pass inevitably and necessarily because of God’s absolute will and divine decree. God wrote the story of your life, the beginning, the middle and the end. The most dreaded decision of your life has already been decided upon. Your destiny is entirely dependent on what God wills and decrees. Hence, everything you do is ultimately predetermined by God, long before you were born. Thus your actions are incidents part of a long chain of events much like dominoes and are reached by a necessary causal relationship between these events ultimately initiated by the good pleasure of God’s will. This principle of universal causality, by the way, is a core tenet not only of the Reformed view of God’s providence, but also of Augustinian and Thomist Catholics, Muslims, ancient pagan religions and naturalistic atheists. Thus, accordingly, most Calvinist’s understanding of God’s plan of salvation is entirely deterministic. God, by his absolute will, has decreed, fixed and selected before the foundation of the world who will be saved through Christ to eternal life and who will be damned to eternal death. Libertarianism, however, is the view that people are self-conscious causal agents that have the ability to choose X or to refrain from choosing X. This ability or power to choose is called free will and the human soul is the seat of free will. By virtue of their creation in the image of God, human beings are free volitional agents. God freely chose to create this particular world out of nothing. Note that this freedom doesn’t mean that someone can do anything s/he likes, but simply that as a free causal agent, by his own choice, any human being could also have refrained from a decision. Free will is essentially the freedom to refrain, i.e. you could have chosen otherwise. This is, admittedly, by no means absolute. The range of your options may be partly outside your control, but you are not necessarily forced to choose something. You are the one in direct control over your decisions and are a direct initiator of an event yourself. Thus the ability to choose is part of who you are, it is ingrained in your soul, so to speak. So it should also be noted that people make self-conscious choices, i.e. our decisions are not impersonal, irrational or morally neutral, but in accordance with our character. But it is not our character, our intentions or reasons that effectuate the choices we make. Reasons aren’t causal agents, they cannot make decisions between themselves: only a person with true causal agency can make such a decision. So, according to libertarianism, the person, the agent who decides is the direct efficient cause, that by means of which an effect is produced, and the reasons behind our decisions, whether for good or evil, are merely ultimate goals, i.e. final causes, which may concur with our decisions. So decisions are made for a reason but by a person. Such libertarian freedom is certainly found in the Bible, f. ex. God permits Adam and Eve to eat from all the trees of the garden freely (Gen 2:16), yet he commands them not to eat from the tree of knowledge of good and evil (v. 17). Similarly, God’s cheerful giver is allowed to give freely and not under compulsion (2 Corinthians 9:7) and Paul writes to Philemon (v. 14) “but I preferred to do nothing without your consent in order that your goodness might not be by compulsion but of your own accord”. The Bible actually ends with a free invitation: “And whosoever will, let him take the water of life freely” (Revelation 22:17 KJV). It is of course a matter of dispute to what extent our freedom is still ours in the fallen and corrupted state of this world. Yet whether by God’s antecedent grace or not, with respect to salvation, Libertarianism holds, accordingly, that, God desires all people to be saved and, therefore, calls all people to salvation, but every human, by his own free choice, has the ability to freely and personally respond to this call by accepting or rejecting God’s free offer of salvation in Jesus Christ. This free acceptance or rejection, generally associated with Arminianism, is what a Calvinist rejects. 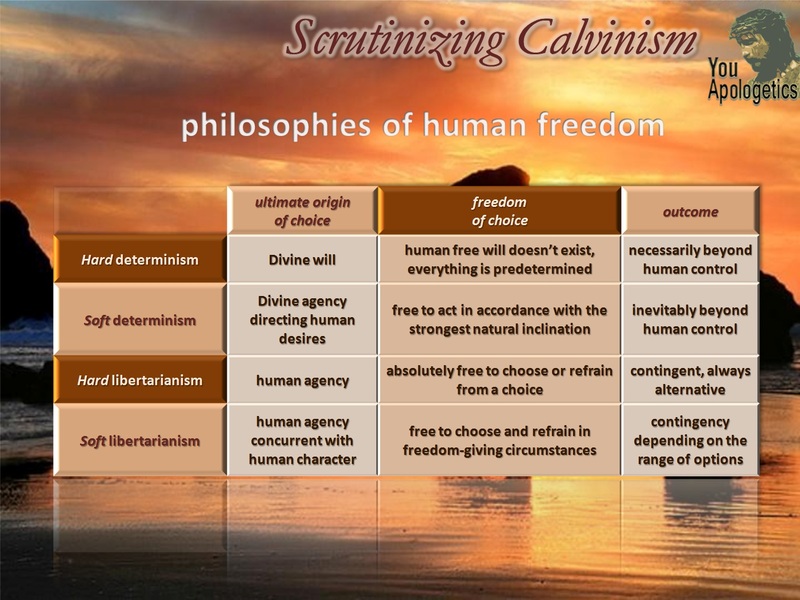 However, if you ever come to a philosophical level in a discussion with Calvinists, which you inevitably will, many will say that they do believe in a form of human free will, something known as Compatibilism. It is an attempt to reconcile the significance of human decisions with God’s predestination by redefining free will. To put it simply, Compatibilists don’t understand free will to be freedom of refrain, but freedom of inclination, i.e. someone is free to act in accordance with their desires. Our choices are brought about by our strongest inclinations and, necessarily, due to God’s concurrent causal involvement, only one choice is possible. Hence, all human activity is the result of choices by real human desires, which inevitably have their origin in God’s will and decree. Note that this is essentially not a form of free will, but a soft form of determinism. For, if someone is only free to follow their desires, then they are not free to refrain after all, but compelled by these desires ultimately resulting from God’s decree. So, contrary to Libertarianism and like Divine Determinism, Compatibilism asserts that not the human agent him/herself, but that God’s will is the invisible primary efficient cause of every human decision and human desires secondary. God is still in primary causal control of human conduct in all aspects of their lives. As you can see, both Divine Determinism and Libertarianism are contradictory to each other. Free human agency simply requires free will. However, the Bible has got something to say about both God’s sovereign providence and the free choices of mankind, for which they alone are accountable. Therefore, a biblical Christian must deal with some form of predestination and must deal with some form of free choice. Nobody can exclude either to make sense of the Bible, a Biblical Christian must say something about both. As we will see, those who maintain Calvinism are often left with mystery to God’s will. Similarly, many Christians conclude that their failure to reconcile divine predestination and human free will must be due to their human fallibility. I don’t pretend to have all the answers, but God is certainly not the author of confusion or contradiction, God is the author of wisdom, logic and reason. If God’s Word is the truth, then it shouldn’t contain logical contradictions. We reason from Scripture using human logic, human language and human thinking, so it is inevitable that our understanding of God and his Word will be incomplete and fallible. Nobody has perfect theology. But if your conclusion from Scripture is unreasonable, inconsistent and logically contradictory, then I’m afraid you’re simply wrong. Some things that the Lord reveals may be beyond reason, but absolutely nothing will go against reason. Fallibility or ignorance is no defence to resort to unacceptable views. Truth is necessarily reasonable and logically consistent. Christians have to find a balance between two Scriptural truths, God’s sovereign control over his creation and humanity’s accountability for their free choices. Calvinism is often weighed against Arminianism. Thus it is often claimed that Arminian theology is the only alternative to Calvinism, but this is certainly not the case. As a non-Calvinist, you certainly needn’t hold to all the distinctive doctrines of Arminianism. One position, for example, that coherently reconciles divine providence and human free will is Molinism, which I believe is the truth in light of Scripture. Molinism is providential enough to be accepted by Calvinists and libertarian enough to be accepted by Arminians, but it is certainly not a combination of the two. You should consider it a soft form of libertarianism. We’ll get back to this later, but in a nut-shell, Molinism is the view that God knows all possible circumstances with every possible person and their free choices in those circumstances, and so, accordingly, God sovereignly decrees a world, where his goals will be achieved perfectly and with precision, so that the maximum number of people will accept his free gift of salvation in their own God-given libertarian freedom of choice. Thus, with respect to salvation, God, by the sovereign freedom of his loving will, has granted humanity’s freedom of choice, therefore, not determining man’s choice, but establishing man’s freedom of choice. He has so ordered the world that those he foreknew would freely accept his offer of salvation in whatever circumstances, will accept him in a freedom-giving circumstance and those he foreknew would reject him freely in whatever circumstances, will reject him in a freedom-giving circumstance. God’s perfect precise plan for the sovereign salvation of humanity is achieved through the free will of his creatures. Follow my series and make your own judgement. COPYRIGHT © 2011 Life put in perspective by Harry a.k.a. Buckleherry. All rights reserved. The dividing line in yo explanation is very thin please try to make understandable to a common person. I understand philosophy but am overwhelmed with inconsistency in the christian explanation between the Calvinists and monolists and arminiasts. No problem, Paul. Thank you for your response. Where exactly did you loose me? What do you consider inconsistent? Hi. I didn’t read the whole thing. (Sorry very busy at the moment.) Your last paragraph.. If it is your summing up belief. I cannot biblically see how God ‘freely offers’ salvation. If He offers salvation, He is just providing an opportunity… So there is no assurance that anyone will be saved. And according to scripture.. if everyone is presented with the opportunity to be saved… NO ONE will choose is. So for God to offer salvation freely to people so they can freely make a choice for it.. no one will be saved. Because NO ONE chooses righteousness. Thus Jesus died for no reason. NT says that God the father gave people to God the Son. The reasoning does not work. God assures that some will be saved. There is nothing unjust about showing mercy to some and justice to others. Can God love fallen man, and punish fallen man that he loves? We have a moral responsibility and accountability.. but we also do not choose God.. He chooses us. He does not present salvation and we ‘freely’ choose it. Quite clearly in scripture NO ONE chooses God.. all have fallen short.. all have turned away… NO ONE seeks God. It is far more gracious of God to assure some to be saved… that to just offer an opportunity (which assures nothing.. according to scripture that would mean that no one is saved, because no one will choose it). Hi, thank you very much for your comment, Lachlan. I’m sorry for a late reply. I have only touched very briefly upon my view of God’s salvation and divine election. The aim of this post was to demonstrate that Compatibilism is false and simply Divine Determinism in disguise. I don’t have the time or space to go into this in detail, but this is just to give you a brief response on your comment from my part, which I hope you will read with an open mind and sincere heart. There is no question about the fact that human beings cannot save themselves. Our Lord and God, Jesus Christ, is the only Saviour, who desires all people to come to the knowledge of the truth and be saved. The question is rather whether he coercively saves people who are unwilling to be saved. I think you misrepresented my view by suggesting that God as some sort of sadist simply offers to everyone the gift of salvation, while nobody, due to their unstoppable rebellion against God, would be able to grasp it. Why would you preach the gospel message to people who are not enabled to freely accept it? That is not only futile, but even sadistic. No, I believe, God would also provide the genuine freedom to accept or decline his offer of salvation freely, as I said. God does not determine the choice of people, but their FREEDOM of choice. God is essentially loving, such that if God would cease to be loving, he would cease to be God. Quite contrary to what you probably intended to say, if God is as irresistibly gracious as you believe he is, then the far more gracious assurance would be that God would instantly save everyone, whether they are willing or not, not just a happy few. If God is mighty to save everyone, why doesn’t he? This is where Calvinists break down: they create a mysterious fog around God’s character and arbitrary justice, while God’s goodness, holiness and righteousness are unmistakable to everyone else. Share book reviews and ratings with MereChristian, and even join a book club on Goodreads.